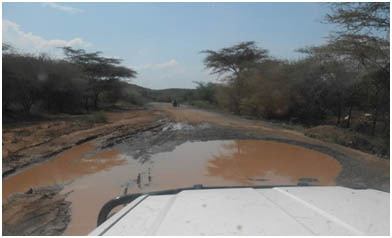 I visited Kositei in 2012 and remember only that the distance was LONG, the road BAD and the air DUSTY. It was decided that Jecinta would accompany Maya and I as far as Marigat, where Fr. Kiriti would meet us. It meant I had to drive north through Nakuru and proceed on a tarmac road with huge potholes. My hit/miss score was about 50-50, so it was very bumpy and tiring. From Naivasha to Nakuru is a good road, but with lots of traffic, much of which is overloaded, smoke-belching trucks going 10 mph. The procedure is that one by one cars, matatus and faster trucks overtake, each barely missing oncoming vehicles who are also trying to overtake slow moving trucks. Over and over I had to do that and was grateful for my young years of driving in a semi-rural area east of Portland, where the roads are equally curvy and passing is the norm. Nonetheless, it is nerve-racking, particularly with passengers whose safety is in my hands. So when we arrived in Marigat some 3 hours later, I was more than happy to hand the driving over to Fr. Kiriti. Before we left, we stopped for lunch in a small hotel where I remembered there was a “sitter” in the restroom. Not all rural areas offer such luxuries. However, rest assured that it was a minimal facility where one was not tempted to tarry. In fact, the ladies stall was locked and we had to use the gents, but no one challenged us. Maya didn’t know where it was, so she asked the lady cleaning the floor where the bathroom was. The woman replied, “You want to take a shower?” They eventually figured it out. I ordered chicken, which must have been frying since last week. It was totally dry, something like chicken jerky only w/o much flavor and greasy. I didn’t tarry over that, either. We bade good-bye to Jecinta who went back home over that same road in a matatu. I was sad and grateful to her for showing me the route and wish I knew Nakuru better so that she wouldn’t have to do that. Forget about a map, as far as I can determine, they don’t exist. Our final stop was at one of the many small stalls that line the road, shopping for watermelon and other produce. Fr. Kiriti’s garden is between crops, so everything must be purchased and trucked in—more about the garden later. The tarmac continued for maybe 20-30 minutes. Some was quite recently laid down, so was smooth and easy, but all too soon, that ended and we were on the dusty lane. Up, down, around and through we went, all 3 jammed into 2 bucket seats. Fortunately, I had brought pillows, to pad the seat. I was in the middle, sitting on the non-seat, so every time that Fr. Kiriti had to shift, my leg was in the way and on that road, the gear shifting is constant. The truck is old, but like an old Ford or Chevy, it just keeps going (only it’s a Toyota!) From time to time he’d stop to allow someone to climb in back or to get out. I really don’t know whether others are so generous, but w/o that nice gesture, people would walk many miles. No one here is fat or even “sturdy”. They are stick thin and STRONG with amazing endurance. Walking many miles each day is a given, particularly now. In the past World Vision distributed free food each week. People would gather from miles around with their sacks to receive maise, beans, cooking oil and flour. It was a program begun during the drought years, but extending so many years that the people didn’t bother to plant when the rains came back. They were perfectly content to be given. Now they are beginning to plant again, but we saw few fields and those we saw were small. Fr. Kiriti says they earn money by harvesting wild honey to sell or by selling their animals, with which the countryside abounds. There are sheep and goats everywhere, with a few cows and some camels, which he says are very valuable (expensive) animals. Here in the parish compound we use camel milk on our cereal and in our tea in the morning. It tastes and looks very much like cows milk. We had to ford several streams, heading down one side, through the water and up the opposite bank. One gets a great appreciation for the toils of the pioneers on their westward trek and just how hard it was. Even very old Toyotas are so powerful by comparison to a pair of oxen. We arrived on Wednesday. Thursday night it RAINED. It pelted down, making it too noisy for me to continue reading to Maya. Eventually I slept, only to awaken at about 1:30 with a very full bladder. I could still hear the rain. ACH, what to do? Finally I convinced myself that no one was out in the rain. I could step outside, whip off my night gown, cover myself with a towel, squat and take care of the problem. The rain would quickly erase the evidence. But as I stepped out, I saw stars in the sky and felt no rain. It was the river I heard. The rain had raised that quiet little stream to a roar. So off I went to the outhouse, back to bed and to sleep, lulled by the sound of the water. On the road after the big rain. They even grow the potholes big in Africa! This morning we went to Chomolingot, about 20-30 minutes away. Fr. Kiriti had been called by the DC (district commissioner – like the governor of the state) to discuss a program to serve people with disabilities, lame, deaf, blind, etc. This town, 100 miles the other side of FAR, has the distinction of a Safaricom antenna so has good network. I had 2 jobs 1) download the visa application form from the US embassy and 2) call Go Daddy to get our website unlocked (I neglected to renew our license). Since it was about 2 am (PDT) there was not much waiting time. So glad GD answers the phone 24/7! 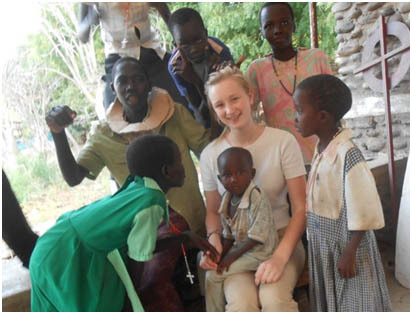 The problem took a bit of explaining, hampered by a crowing rooster and a group of Pokots gathered around Maya, curious about this blond mzungu. GD has now unlocked the site and my very capable support in the US will take care of the renewal, so we’re back in business. I wish I could report the same success with the visa app. My computer downloaded 171 pages (pdf) from the US Embassy site. ARG!! I figured it was many duplicates, so saved it and figured I could cut it down to 1 copy. Thought I’d been successful but later had a message that it couldn’t be saved b/c it was a format my computer did not recognize. RATS! Will try again back in Naivasha where the network is better. Back in Kositei, we had lunch and a nap. It’s hot in the midday, so a siesta is very much in order. Later, I found Fr. 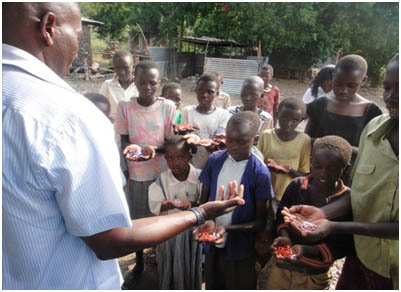 Kiriti in his garden, planting the tomato seedlings he had previously grown in a special bed. The soil here is wonderfully rich, but full of rocks. Plants flourish. In addition to the tomatoes he has kale, sukuwiki (traditional greens) cucumbers, ndengu (another traditional leaf veggie) and sweet potatoes. He loves to plant and hopes that he is being a good role model for the Pokots. The children from the local school come afternoons for catechism classes taught by James, the seminarian here. Today the were given rosaries, lovingly made by my sister-in-law Annette. They came running over to the kitchen where Fr. 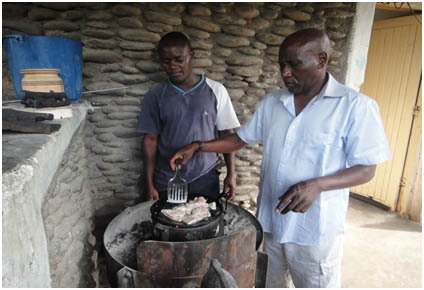 Kiriti was showing Edward, the cook, how to prepare fish. They wanted him to bless their rosaries, which he did. They like to hang around to just be together and Maya is a major attraction. However, I noticed some older kids by the kitchen and asked what class they are in. “Class 8.” “Would you like some help with math?” Smiles. We set up around the desk in Fr. Kiriti’s office. They would indicate a problem, which I would explain. My English is very hard for them, but inevitably one of them would understand. Once I saw that expression on the face I delegated him/her to explain to the others. Slowly by slowly I’d see the look that said, “I get it.”. After maybe an hour I had an idea. I’d ask Fr. Kiriti to make a blackboard in the area where they come for the classes. I talked to them, asking whether they would come each day and teach each other. I could see they are bright, and I think they can do a lot. They seemed to like the idea, Fr. Kiriti agreed and I think maybe it will work. Time will tell.